The previous blog looked at the extraordinary complexity of life supported by soils, in particular healthy, productive soils. 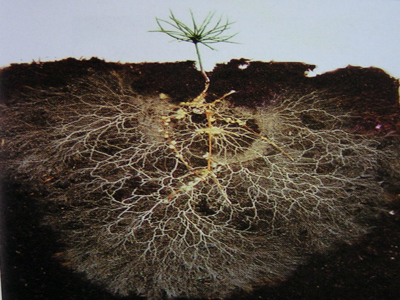 This is especially true in the rhizosphere, the soils directly affected by plant root secretions. Key functions modulated by microbes include plant nutrition through the release of inorganic phosphorous in soils, the fixation of atmospheric nitrogen, plant growth (many bacteria make and secrete hormones to which plants respond) and plant defence by protecting plants from attack by pathogenic bacteria and fungi. Conversely, soils depleted by intensive cultivation of single crops also have less diverse microbial communities, higher numbers of soil-borne pathogens, and lower levels of organic matter. A key question is therefore how to harness or influence the microbiome to restore damaged land and improve the productivity and sustainability of agricultural practices. The very large number and diversity of components involved and the complexity of interactions between microbes and plants, which are not fully understood present significant challenges. This blog aims to briefly discuss some of the approaches taken. One strategy to improve degraded land is to introduce soil derived from healthy ecosystems. This study, for example, examined the effects of adding soil (as a 1 cm thick cover) from grassland and heathland to land previously under cultivation over a six-year period. The researchers observed that the added soil affected the composition of both microbial and plant communities and promoted soil restoration, especially when the topsoil of the recipient sites was removed. Interestingly, they also noted that the donor soil directed the development of the microbial and plant communities towards that of its origin. The strong association between plants and the microbes they host is sometimes referred to as the “soil memory”. Memory can be established by compounds secreted by the plant roots which impact the composition and activity of microbial communities, and these in turn are able to influence future plant generations. In addition, there is evidence that plants can “inherit” beneficial microbes from their parents, as shown in these studies on wild flowers and strawberries. Long-term, reproducible effect of soil microbiome on plant characteristics were also demonstrated in an experiment where early- or late-flowering microbiomes were developed over ten generations of plants. Inoculation with the late-flowering microbiome not only changed flowering time but also resulted in increase of plant material correlated with a two- to five-fold increase in enzymes associated with nitrogen fixation in soils. The most common intervention has however been the addition of biofertilisers, which are usually single bacterial or fungal strains known to have a beneficial effect on plants. This can be done either through the inoculation of soils or by coating seeds and/or plant roots with the beneficial microbes. One example are bacteria of the Azospirillum genus which promote biomass accumulation in a number of important crops since they are able to influence plant growth and promote the growth of roots. However, these bacteria do not survive in soils with a high concentration of salt. To overcome this problem, a research group in Mexico has developed a genetically modified, salt-tolerant Azospirillum strain and shown that it confers drought tolerance to inoculated maize plants. Since efforts to develop improved crop varieties have so far neglected aspects related to the ability of crops to establish beneficial microbiome relations, it is very likely that many genetic factors associated with this characteristic have been lost in the process. Another approach to improve plant productivity is therefore to develop next-generation crop varieties by simultaneously selecting beneficial characteristics in the plant and the microbiome, jointly considered as a unit of selection called the “holobiont”.